Busy years with signings and presentations! On July 28, 2003, Marjorie Ransom and Bassam Alkahouaji spoke at the Textile Museum about the silver jewelry and textiles of the Middle East, using live models to illustrate. 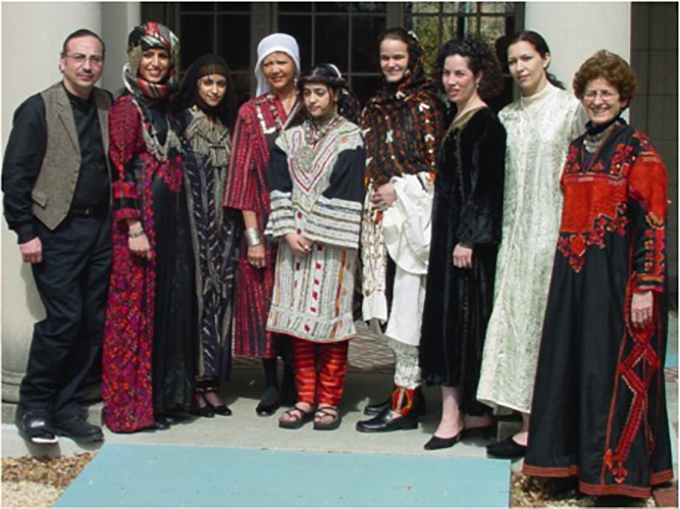 Left to right, Bassam Alkahouaji, Syrian textile expert, and women wearing costumes, left to right, Syrian, Yemeni Sanaa, Egyptian Bahariyya, Egyptian Siwa, two Algerian, and Syrian. The women are, left to right: Danya Malki, Rima al-Shawkani, Patricia Waller, Lamees al-Shawkani, Sarah Ransom McKenna, Mimi Keghida and her friend, and the author. Marjorie Ransom lectured about the traditional jewelry of the Middle East in Washington at the Society of Woman Geographers, the Middle East Institute, the Textile Museum, the Jerusalem Fund and the Bead Society of Greater Washington. She also spoke at the 20th Century Club in Pittsburgh, the Bowers Museum of Cultural Art in Santa Ana and the Mingei Museum of International Art in San Diego, California and the Jefferson County Historical Society in Watertown, New York. She spoke about Yemeni traditional silver jewelry during the Yemeni Heritage Symposium at the Freer Gallery in Washington in September 2003. Marjorie Ransom and Bassam Alkahouaji spoke at the Textile Museum on July 28, 2003 about the silver jewelry and textiles of the Middle East using live models to illustrate. Arab American National Museum, Dearborn, Michigan. Georgetown Senior Center, Washington, DC. Museum of Jewish Heritage, New York City. The Freer-Sackler Gallery, Washington, DC. Bead Society of Greater Washington, Chevy Chase Community Center, Washington, DC 20015. The Graduate Center, City University of New York, Middle Eastern and Middle Eastern American Center, MEMEAC, New York, NY. Alwan for the Arts, New York NY 10004.